PREV is a liquid, all natural solution to combat runner’s diarrhea. It also works great for the pre-race/competition anxiety, nausea, and upset stomach. The flavor is a refreshing smooth mint. It’s not thick or gooey and goes down as easily as a tablespoon of water. PREV is a tested and extensively researched formulation that will help you take control of your next run. PREV is a liberation from the stomach cramping and bathroom breaks that have been dictating your running schedule, route, and performance. 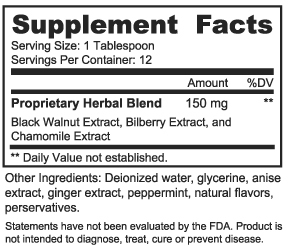 Each of the ingredients in PREV plays an important role in stamping out runner’s diarrhea. These herbs have been carefully selected for their soothing properties. Together, and in the right proportions, they work to eliminate your symptoms and help you enjoy your long runs. Black Walnut—promotes healthy digestion, helps to balance blood sugar, has anti-bacterial and anti-diarrheal properties, and helps to flush out toxins and pathogens from the body. Star Anise—used in Eastern medicine to treat nausea and vomiting, naturally freshens bad breath and soothes the stomach. Ginger—calms an upset stomach, naturally freshens breath, relieves nausea and dizziness associated with motion sickness, relieves gas and bloating, anti-diarrheal properties. Chamomile—soothes nerves and stomach aches, eases symptoms of IBS, promotes healthy digestion. Bilberry—reduces inflammation, improves circulation, antiseptic, anti-diarhheal properties.